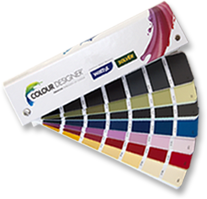 For a fresh take on comprehensive colour, choose Colour Designer. One palette, premium paints, more than 1340 colours. Colour Designer, from leading brands Wattyl and Solver, is the new paint selection system designed to make it easy. Colour Designer offers one integrated range of market relevant colours that will complement any project whether residential or commercial, new or repaint. The Colour Designer palette joins trusted colour choices from both Wattyl and Solver, and builds on them by introducing a new range of truly versatile hues. Together, there are 1343 colour options, reflecting global directions from all facets of textiles, materials and finishes. From refined chalks to pops of brights and everything in between, there are choices from the full spectrum of colour. An expansive group of 385 classic and contemporary whites and neutrals is a highlight. Whatever your selection, each Colour Designer colour has the potential to get the most out of your space. Colour Designer colours are available in products from both Wattyl or Solver ultra premium and premium paint products. So whether it’s interior (Wattyl Interior Design® or Solver Ultra®) or exterior (Wattyl Solagard® or Solver Duraguard®), there is a superior paint in the colour you want for the job. For over a century, Wattyl and Solver together have manufactured premium quality paint in Australia. Extensive research and development continues to create consistent and accurate tint formulations, together with trusted paint performance and durability. All Colour Designer colours are tinted with Ecotint® low VOC, low environmental impact colourants. Always choose Wattyl or Solver paints for an accurate Colour Designer match. 2012 The Wattyl Group. All Rights Reserved.